My recent experience on the Three Capes Trek, Tasmania, has inspired me to share more about the health and wellbeing benefits of overnight hikes and treks. I am fortunate to have completed some wonderful hikes and treks in New Zealand, Tasmania, Queensland, and Nepal. Overnight hikes and treks often require the development of new skills and knowledge. This starts from the research stage, right through to safely completing it. Most importantly—clothing, bedding, shelter, food, water and first aid kit. 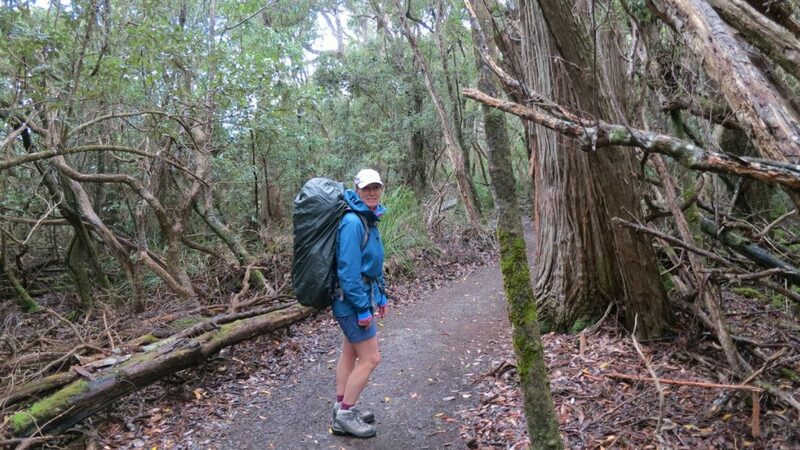 I often laugh when I recall my first overnight hike in New Zealand. The Department of Conversation NZ huts provide gas in the kitchens for cooking during the hiking season. My pack was full of heavy fresh and canned foods and juices—we had over-catered, but at least there were many willing helpers (fellow hikers) to lighten the load. For me, one of the true benefits of overnight hikes is being able to immerse myself in nature. You see sunsets and sunrises. You see animals and tiny creatures that wouldn’t otherwise see. You also experience the weather as it changes, which often calls for a change in outerwear. Reconnecting with the quiet can be difficult at first. You hear the noise in your head on day one. You start recalling all of the tasks that went unfinished, or you may start thinking up events that could spoil your hike, such as a storm. But then, there is no noise in your head. There is a sense of calm and newfound purpose. You become more aware of the sounds of nature—the wind, the ocean, the river and the animals. Out of mobile and internet range? Or just turn off the gadgets to provide one less source of noise and distraction. One of the barriers to contemplating or going on overnight hikes might be fear. Coming from the comforts of our homes and entering in the wilderness for three or more days may require us to face some of our fears. And don’t worry a few of these have been mine too, which I will share in upcoming posts. Even day hikes are best shared with a friend. This doesn’t mean you have to spend 100% shadowing each other or talking the whole time. From a safety perspective, for self-guided overnight walks a minimum of four adults is recommended. This means if someone is injured, then one person can stay and two can walk out for help. An EBIRB (emergency position indicating radio beacon) and satellite phone are recommended too. Trekking overseas also allows you to experience new cultures. When you complete multi-day hikes or treks in rural and remote regions, you get to experience the food and day-to-day life of the local people. My strongest impression of Nepal from my first trek in the Manaslu region was the sheer delight children expressed from going to school. Not all village children, at that time, had access to school education. Their excitement seemed such a contrast to how school education is often taken for granted, and sometimes dreaded, in my own country. Every step you take contributes to movement. And we know there is a range of benefits to walking 10,000+ steps a day. With the extra load of your backpack for overnight hikes, your body is working harder each step you take. This is good for muscular strength, your metabolism and balance. Walking on natural terrain and manmade steps require us to stay mindful as we walk. Many walks provide exposure to both forests and oceans. Shinrin-yoko is a Japanese expression to describe ‘taking in the atmosphere of the forests’ or ‘forest bathing’. Trees release a natural oil, called phytoncides, to protect themselves from germs and insects. Whilst we spend time in forests, we breathe in the phytoncides and they help increase a type of white blood cell called natural killer cells. Research studies show that humans benefit from forest bathing through increased immune function, increased ability to fight disease and improved mood. Doctors have prescribed the seaside for common ailments since the 18th century. Both the seawater and air provide physical and mental health benefits. Ocean water contains a range of minerals including calcium, chloride, magnesium, sodium, and sulphate, which means it can be helpful for skin conditions. However, an open wound may be a risk of bacterial infections. Seawater is also used to ease muscular aches and pains and flush nasal passages to reduce hay fever and sinus issues. Sea air contains negative ions, which support the absorption of oxygen and help balance serotonin (a hormone involved in regulating mood and stress). This contributes to the feels of being relaxed, yet alert and energised after a seaside holiday. The landscape can trick you. So often I have thought that I have had a summit or mountain pass in my sight, only to realise that I am mistaken. Especially at high altitude (for me about 2600 metres) it is important to just focus on taking one step at a time, pausing to admire the view and breathing deeply and completely. I often repeat the Nepalese words “bistari, bistari”, which mean “slowly, slowly”. After multiday walks, you may find that this approach flows into your regular day to day life too, providing a sense of calm and spaciousness. Every destination is reached, one step at a time. Time in nature provides nourishment for your soul, spirit or mind—whatever you like to call—your inner higher guidance. A multiday walk provides space and focus, supporting your mind to switch off from the usual chatter. You find that you start focussing on the ‘here and now’ and mindfulness becomes more natural. For me, I gain a sense of connectedness, spaciousness and calm confidence. This sits alongside the physical tiredness that arises from 8 hours of walking carrying my pack. If I am lucky, I may even find solutions to current concerns or inspiration for a new project. In future posts, I will be sharing my hiking and trekking experiences, as well as practical tips to make overnight hikes more enjoyable.